It is no secret, a hot tub will increase your utility bill, but don’t let that get in the way of enjoying nice warm hot tub sessions during cold winter evenings. Here, I will provide you with a few tips and tricks for keeping the cost down. Pin this awesome infographic for later. How Much does a Hot Tub add to your Energy Bill? 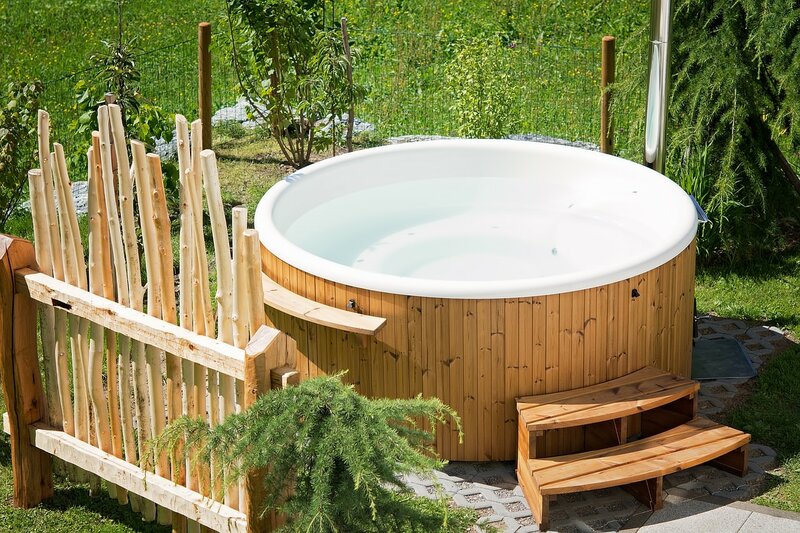 Depending on several factors, a hot tub can add anywhere between 10-20% to your energy bill. This is my best guesstimate. Even big manufacturers, like Jacuzzi, don’t have an answer. The cost will depend on many different variables, including the use of the hot tub, the price of energy where you live, the outdoor temperature, the quality of your equipment, etc. Some manufacturers, however, offer energy calculators on their websites, which can provide a better idea of what to expect. While it is impossible for me to provide a firm answer to this question, I put together a quick guide on how to reduce your hot tub energy bill. The number one way to reduce your hot tub energy costs is to have the right hot tub cover for your environment. Depending on the area you live in, consider buying a deluxe or extreme cover. A good cover will trap the heat inside your tub, so the pumps and heating system won’t have to work so hard. Make sure to regularly check the hinge. The hinge is where most of the heat escapes, even with a new or good hot tub cover. Hot tub covers usually come with two steam stoppers at each end of the middle hinge, which are usually enough for most climates. If you live in a colder climate, like Canada for example, the full length steam stopper is a worthwhile upgrade. Also make sure the cover fits perfectly. If your cover is too small or too big, it can cause heat or water loss and will keep that meter running and your energy bill rising. If your hot tub is located in a windy environment, you may want to create a windbreak around your spa. You can use fences, trees, privacy panels or anything that fits your backyard design. Not only will it prevent the wind from cooling your water, but it will guarantee a better time when you’re using your hot tub. You can even install some solar panels to make your hot tub a little bit greener. Another thing you may not always think about is to lower the thermostat of your hot tub while you’re on vacation. During the summer months, you can even turn it off entirely. During the winter though, you will need a minimum of heat to prevent the water from freezing and causing damage to your hot tub. Do you know that your appliances work harder when it’s peak energy time? Usually, mornings and evenings (around dinner time) are the highest peaks for energy consumption because every household uses electricity at the same time. So you might want to set your hot tub to heat between 11 PM and 7 AM. A good cover will keep the heat inside your hot tub long enough for you to enjoy a nice and warm after dinner soak, without needing much more heating. You can choose a hot tub cover with an energy reflective underside. The material used on this type of underside is silvery and reflective. It bounces heat energy that escapes from the water back down into the tub. It also helps protect the cover from water and chemical damage over time. Use either a bubble cover or a floating thermal blanket to prevent water from evaporating. Don’t forget to turn off all of the air controls when you get out of your spa. You can reduce heat loss in your hot tub by adding a little insulation inside the cabinet. You can do so by simply filling large garbage bags full of insulation and placing them into the open areas of your cabinet. Make sure all of your equipment functions properly, especially the filter. If the filter is clogged, it will work harder to do its job and use much more energy. Remember that most of your adds-on (like lights) require electricity to run. If you want lights in your spa, make sure they are LEDs, and don’t forget to turn them off when you get out of your spa. The key to lowering the cost of running your hot tub is about increasing its ability to hold heat. By keeping the heat in, you reduce the amount of energy necessary to maintain the temperature. This can help keep your energy bill more manageable, all year round. The number one step you should take is to buy a hot tub cover that fits your hot tub and your environment. Then, think about setting up windblocks, lowering the thermostat and heating your hot tub at the right time. 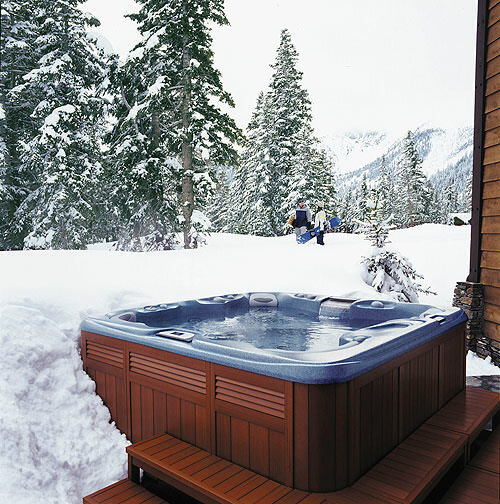 Do you have any other recommendations that helped reduce your hot tub energy cost? Let us know!